The brand new Made to Measure Wedding Collection from River Elliot Bridal. Order using your basic measurements to get a custom-made wedding dress. Our new range is inspired by the modern bohemian bride. Polly is our statement black wedding dress. 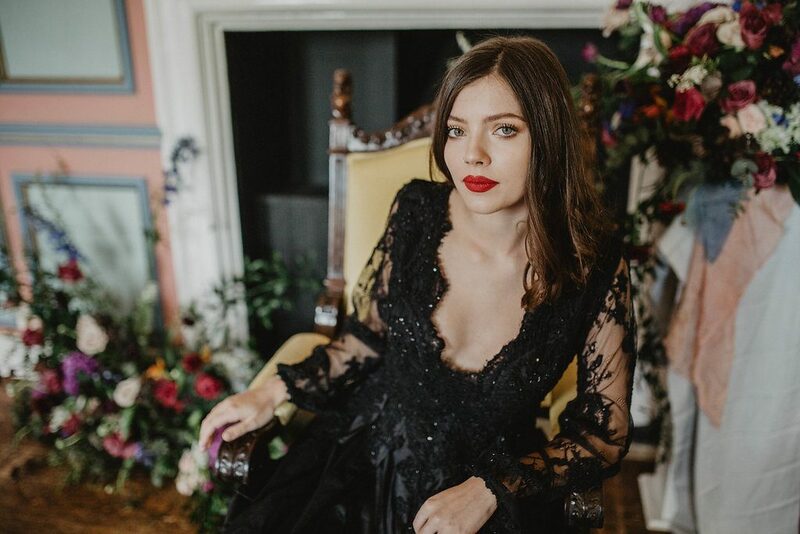 This black wedding dress is designed especially for the bride who wants a different, alternative wedding dress that emanates classic Hollywood and red carpet vibes. Inspired by the sheer beauty of the golden movie era, Polly features a boudoir-style black lace, set over an organic silk taffeta bodice. The neckline plunges to a daring, sensual depth while the full black taffeta skirt is pleated dramatically. The lace on this black wedding dress is a sumptuous black corded lace with beautiful black beading. It is both feminine and sultry, yet also evokes a strong, powerful image. The bodice cinches in at the waist to define the figure, while black lace applique is hand sewn down the skirt pleats for extra detail. Polly is a black wedding dress and is available in this colour only. 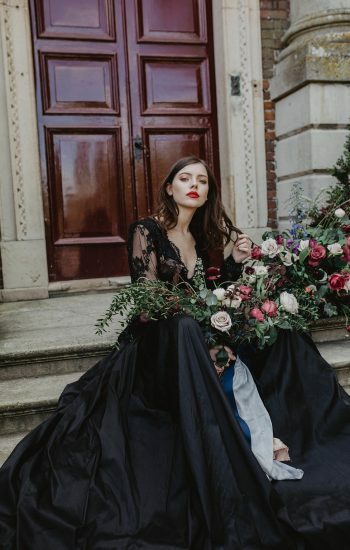 This wedding dress features a stunning black corded lace underlined with black organic silk taffeta. The skirt is black organic silk taffeta and is lined with a premium lining, which is anti-static and breathable. An invisible zip fastens the dress at the back, while the slightly billowed sleeves are elasticated at the wrist for ease. Polly is available to try on in our bridal studio in Cambridge by appointment only. 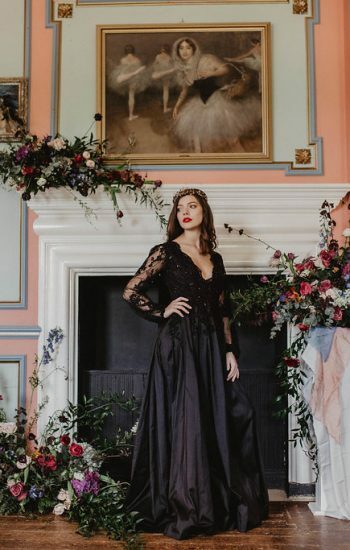 In this picture, our Polly black wedding dress has been styled with a headpiece by Fancy Bowtique Bridal Couture (sold separately). Photos by Camilla Andrea Photography. Check out more images and styling from this photoshoot at Rock My Wedding.